With UNICEF-supported remedial classes, children in Tartous prepare for their national exams. 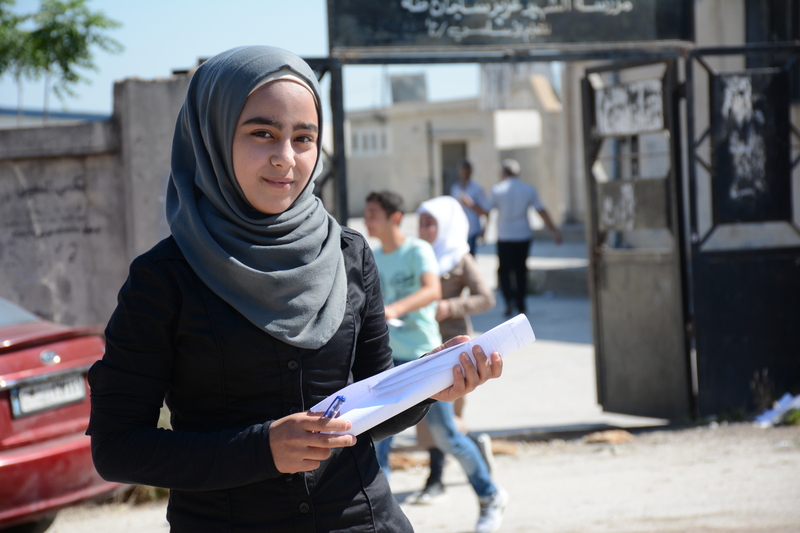 For two years, Jamila, 15, and her family lived under siege in their hometown of Foah in Idleb. With violent fighting and severe lack of basic commodities, some days Jamila only have one meal a day. “There were days where I gave up my meal for one of my younger siblings,” recalls Jamila, who spent her days under siege helping her parents care for her siblings. “Something as simple as starting fire to cook for them would take me an hour, all we had was wet wood to use.” Furthermore, the family had to sleep in a basement for days, waiting for the fighting to stop. Despite hunger, fear and exhaustion; Jamila never lost her determination to continue her education. Every day, Jamila would go to the only functioning school in town, where she studied for merely two hours. To accommodate the large of students; the schools was running classes in shifts. “Even my education was irregular, whenever there was fighting we were forced to stay at home for weeks at a time,” says Jamila. Last year, together with her family, Jamila fled Idlib to rural Tartous, where she enrolled in school. Having been studying only sporadically, Jamila felt she was lagging behind her peers, until she heard of the remedial education sessions at the UNICEF-supported centre. “I’ve been going to this centre every day after school for one year now,” says Jamila, speaking outside her exam centre after sitting for her English exam. “The teachers answered all my questions, explained lessons and helped me overcome all the difficulties I was having.” Even during the exams period, students participate in extensive sessions to prepare ahead of each subject. “I want to tell all children, especially those who are struggling like I struggled, wherever they are, please don’t give up on education, no matter what. We are nothing without education,” adds Jamila who aspires to be a doctor one day. Last week, over 250,000 children across Syria are sitting for their national Grade 9 exams, including students who have benefited from the UNICEF-supported remedial education programme in Tartous. The supporting sessions aim to help children who are at risk of dropping out of school to catch up with their peers and continue their learning, including those who missed out on years of education due to conflict and displacement and those lagging in their studies. Last year alone, and with thanks to the generous contribution of Canada, almost 900 children aged six to 17 engaged in these sessions in Tartous and its suburbs, including 50 who are sitting for their Grade 9 exams this week, having prepared well at UNICEF-supported centres.